Jack Chick, fundamentalist cartoonist, died at age 92, on October 23, 2016. His most popular comic book tract was This Was Your Life, viewable in full at www.chick.com, though I have included a few pages here. 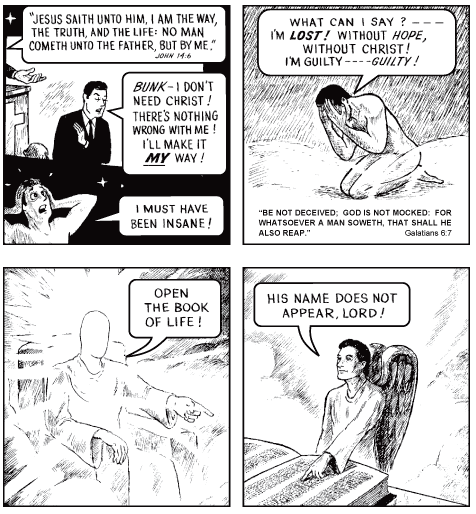 Jack Chick and the popular obsession with fear at Halloween have a lot in common . I read my first “Chick tract” at a highway rest stop on Interstate 95 as a teenager. A middle-aged gentleman handed me this small comic book, spoke a few words, and before I could glance at what he gave me, the man quickly walked away. It was Jack Chick’s tract, This Was Your Life. I was already a follower of Christ, but what I read disturbed me, in more ways than one. In one sense, Jack Chick was right. Before the scene shown above, a man who lived his life indifferent to the things of God, dies. Then this dead man was brought before the judgment seat, having his entire life exposed before the Lord, like on a theatre screen display. The hidden things were brought to light, demonstrating that his life, lived apart from Christ, had negative eternal consequences. He thought he could “get away with” sinful thoughts and actions in his life, thinking no one would notice, when in reality, nothing escapes the notice of God. 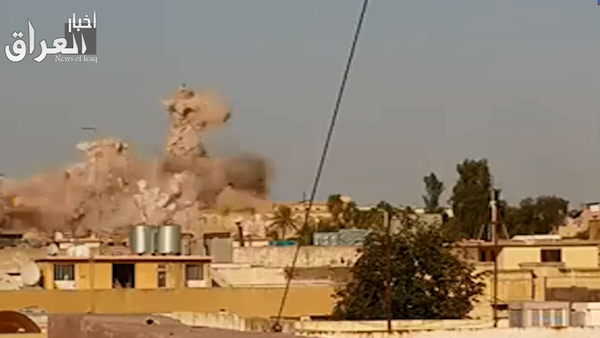 In July, 2014, militants of the Islamic State blew up the Tomb of Jonah, a memorial site with significance for both Muslims and Christians, as it honored the famous Old Testament prophet, called to preach in the city of Nineveh, now part of modern-day Mosul, in northern Iraq. Much of the attention surrounding the Book of Jonah focuses on the story of Jonah being swallowed for three days and three nights by a “whale.” There is a lot of confusion about this. For one thing, the actual Bible text calls it a “great fish,” and not a “whale” (Jonah 1:17). But in this post, I want to focus briefly on the city where Jonah was called to preach: Nineveh. Nineveh was the capital of the ancient Assyrian empire. The Bible talks quite a bit about the threat that the dreaded Assyrians posed for the Israelites, a threat that was eventually realized by the destruction of the Northern Kingdom of Israel, in the 8th century before the birth of Christ. So, you only imagine the horror experienced by the prophet Jonah, first mentioned in 2 Kings 14:25, when he was called by God to urge the citizens of Nineveh to repent, and come to know the God of Israel. Nineveh was the last place Jonah wanted to be. Fifty years ago this week, the great British evangelical independent preacher, Martyn Lloyd-Jones, clashed with Anglican, John R.W. Stott, another great British pastor, over the future of the evangelical movement in the United Kingdom. Jones was urging evangelicals to leave corrupt institutions, whereas Stott pushed back, reminding fellow evangelicals of the importance of maintaining a Christian witness. Stott’s argument won the day, yet Puritan historian, Iain H. Murray, believes that the acceptance of Stott’s efforts led to evangelical compromise. However, the following blog post, by British blogger Alastair Roberts, offers a different perspective, that I find helpful to think about. A couple of days ago, Justin Taylor published an interview with the Rev Dr Andrew Atherstone, upon the fiftieth anniversary of a pivotal event in English evangelical history. At the National Assembly of Evangelicals on October 18, 1966, two of the biggest figures among British evangelicals in the day, the Welsh minister of Westminster Chapel in London, Martyn Lloyd-Jones, and John Stott, rector of All Souls Church, had an important dispute about the future of evangelicals within the Church of England. Lloyd-Jones gave an address calling for evangelicals to pursue visible unity with other evangelicals, accusing Anglican evangelicals of schism for their failure to unite with evangelicals outside of the Church of England, and of serious compromise for their continued involvement in a mixed denomination alongside doctrinally and spiritually unfaithful persons. Although he was the chairman, Stott publicly responded to Lloyd-Jones’ remarks, resisting his claims and appeal to Anglican evangelicals. Luca Signorelli. The Deeds of the Antichrist (1499-1504). 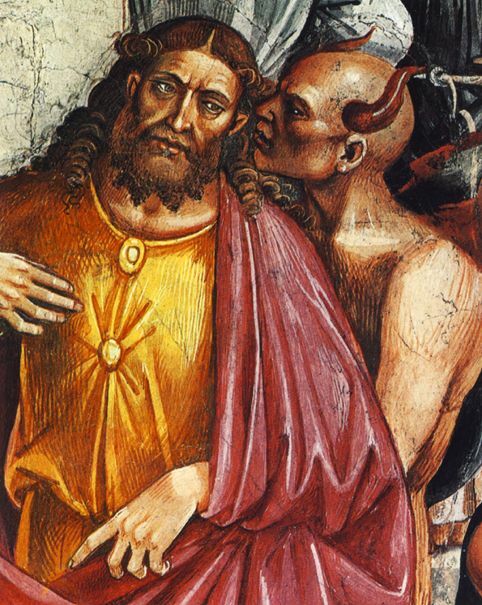 Signorelli portrays the devil counseling the Antichrist. With an American Presidential election coming around the corner, I wonder who so-called “prophecy experts” might pick as the one and only Antichrist in our day? So, who exactly is “the” antichrist? Okay, let us fast-forward some 35 plus years. He may not have been the best President we have ever had…. but the antichrist? A lot of people speculate on who this antichrist might be. From military dictators to American presidents, the list of possible candidates seems about as endless as the human imagination (some folks even vote for their favorite picks). Most people get their information about the antichrist from books, movies, late-night cable TV, neighbors and friends. But how many people know what the Bible actually teaches about the antichrist? You might be surprised to discover that a lot of popular ideas about antichrist owe more to overly fertile imaginations than the clear teaching of Scripture.